In last week's edition of the Chronicles, we talked about the prosperity of Gardarshoft and how amazed we were with their progress and their ability to set aside their difference, instead choosing to focus on the growth of the Kingdom as a whole, rather than squabble over petty differences. Diplomatic talks have all but broken down, as some of the top-ranking clans within the Kingdom have turned on one another, drawing swords and pointing them at each other’s throats and uttering vile threats. 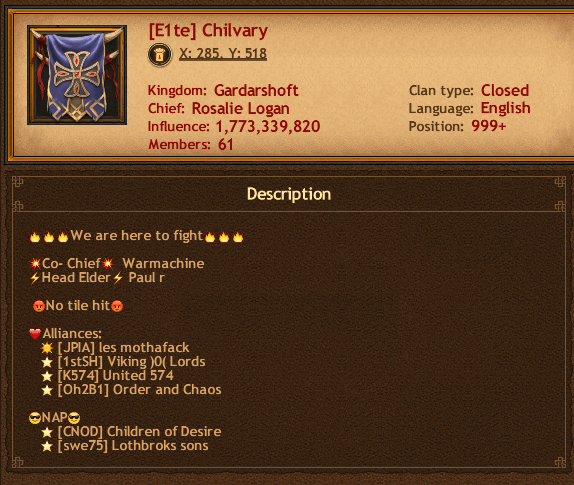 Two such clans that have turned on each other are the Elite Chivalry and Heroes clans, the former being the second-ranking clan within the lands and the latter the top-ranking, and thus the most influential within Gardarshoft at this time. 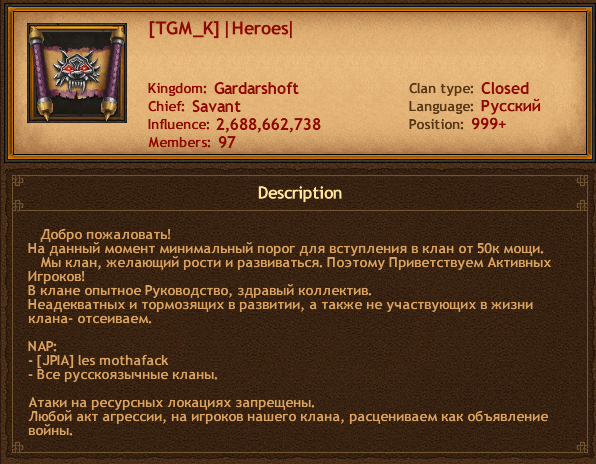 Both of these clans were previously the ones leading the charge to unite the forces of Gardarshoft from the coming onslaught they are soon to experience in their first of many Kingdom vs. Kingdom wars to come. This unity was something to behold given the Kingdom’s young age, but alas, it was not meant to last. 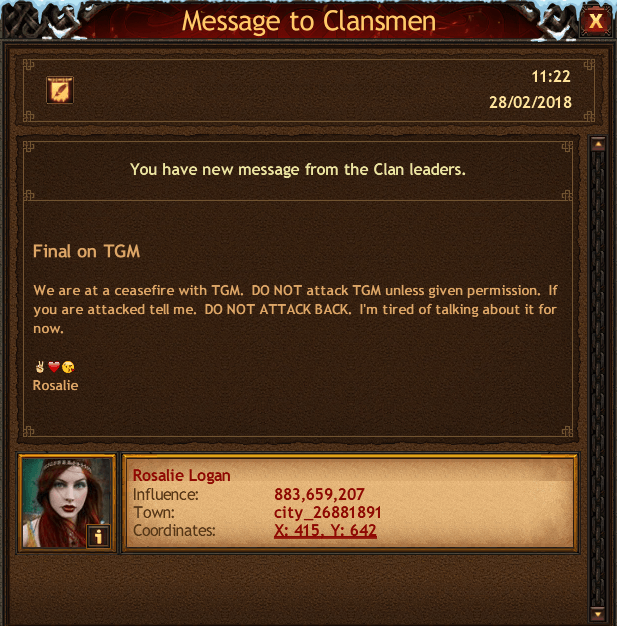 The two top-ranking clans turned on one another as diplomacy broke down on all levels, and it was only a matter of time before these drawn swords were used on one another and blood was spilled. 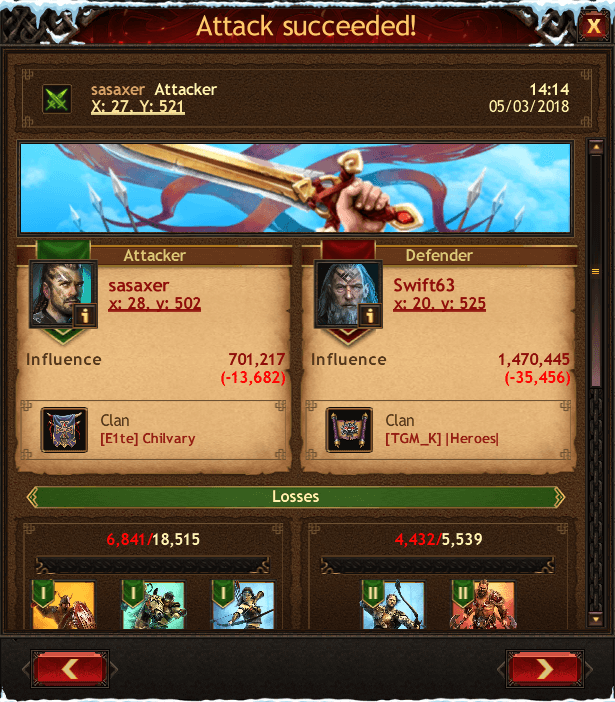 With the Elite Chivalry's Chieftain calling the leader of the Heroes clan a liar and a thief, the war was on, and troops began to march on each other’s towns. The Elite struck first, sacking the Place of Power, as well as a large number of towns before the Heroes even had time to react. This one-sided conflict was not destined to last. 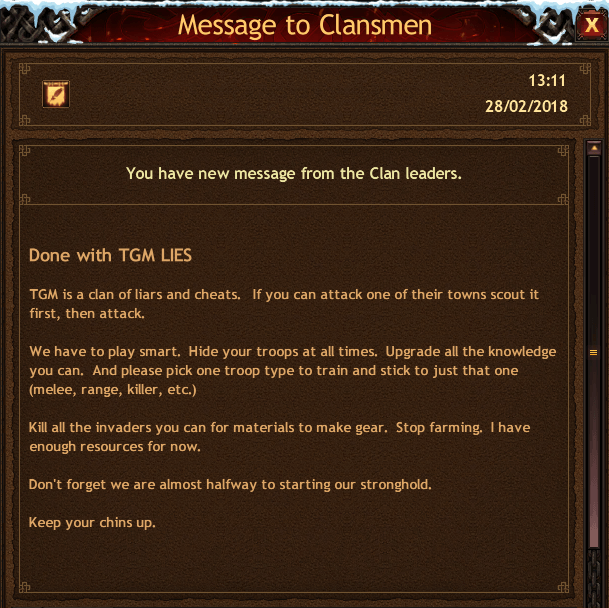 The Elite Chivalry had struck out against the most powerful clan within Gardarshoft, and this slight against their honor would not be tolerated. 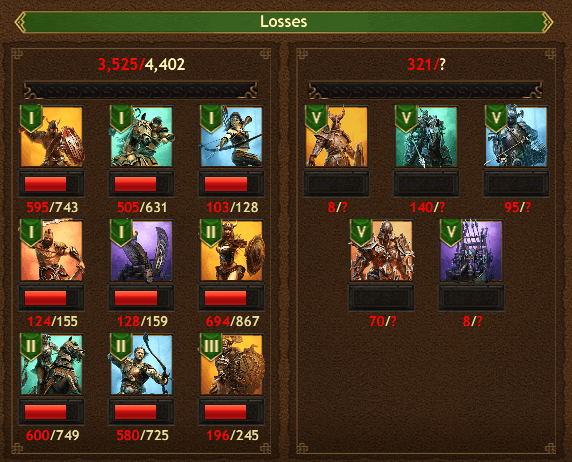 With a Kill Event underway, the Heroes struck back, returning the favor as they destroyed army after army. For the moment, the action has settled, but without completely dissipating. Both parties are still at war with one another, have withdrawn their forces and are beginning to gather their resources as they focus on building their collective strength for the next series of battles against one another. 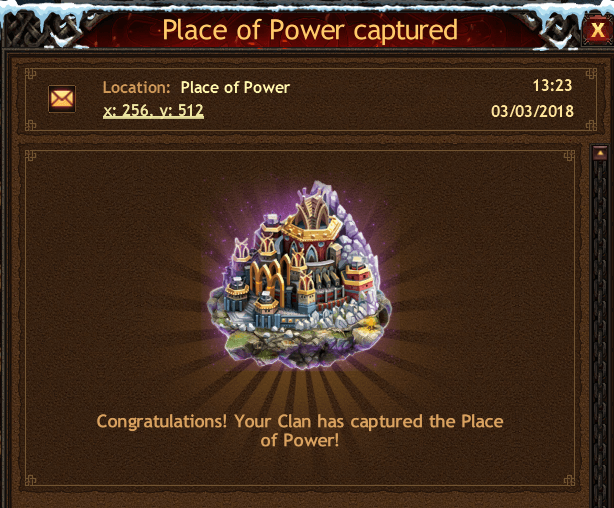 Strongholds are underway, and an arms race has begun. Hopefully, these two powerful forces will be able to set aside their differences once again and focus on the rebuilding of Gardarshoft, before it is too late.